On Tuesday we shared NASA's new photo of a fully illuminated Earth. 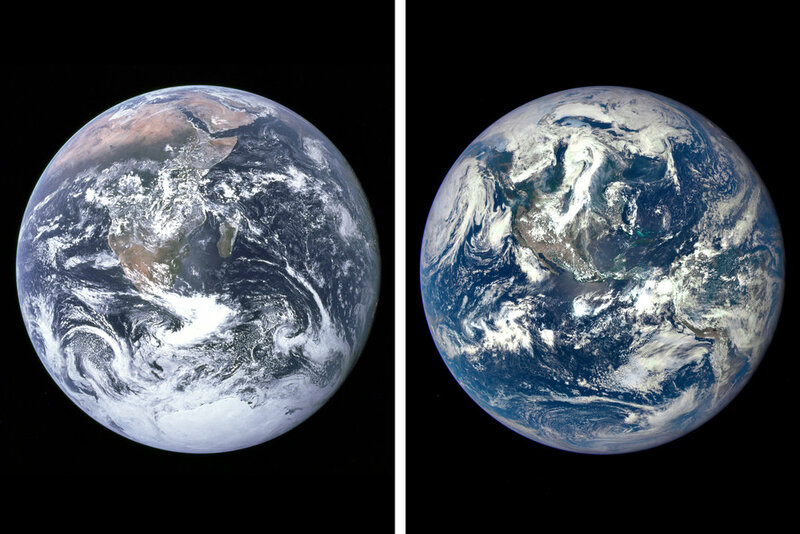 This is an update to the “Blue Marble” photo taken by Apollo 17 astronauts in 1972, more than four decades ago. Here, you can compare the two. “How perfect North America looks. I am still amazed by how the oceans dwarf the continents,” Jim Corradino of Norwalk, Conn., wrote us. “There’s something remarkable about a single snapshot of the Earth — an intact view of our planet in its entirety, hanging in space,” the astronaut Scott Kelly observed in an essay on Medium. He explained what makes these images so special. Along with the challenge of getting far enough away to get the entire Earth into a single frame, there is the matter of lighting. “In order to view the Earth as a fully illuminated globe, a person (or camera) must be situated in front of it, with the sun directly at his or her back,” he wrote. Consequently many of the images of Earth we see are actually composites. This is just the first in a series of images of Earth that will be sent back from a million miles away. We will soon see the other side, fully illuminated as well. What is just as amazing as the number of maps churned out by the Soviet military is the fact that none of these maps are copyrighted since the Soviet Union was not a signatory to the Berne Convention on copyright. A MILITARY HELICOPTER was on the ground when Russell Guy arrived at the helipad near Tallinn, Estonia, with a briefcase filled with $250,000 in cash. The place made him uncomfortable. It didn’t look like a military base, not exactly, but there were men who looked like soldiers standing around. The Soviet Union was falling apart, and some of its military officers were busy selling off the pieces. By the time Guy arrived at the helipad, most of the goods had already been off-loaded from the chopper and spirited away. The crates he’d come for were all that was left. As he pried the lid off one to inspect the goods, he got a powerful whiff of pine. It was a box inside a box, and the space in between was packed with juniper needles. Guy figured the guys who packed it were used to handling cargo that had to get past drug-sniffing dogs, but it wasn’t drugs he was there for. Inside the crates were maps, thousands of them. In the top right corner of each one, printed in red, was the Russian word секрет. The maps were part of one of the most ambitious cartographic enterprises ever undertaken. During the Cold War, the Soviet military mapped the entire world, parts of it down to the level of individual buildings. 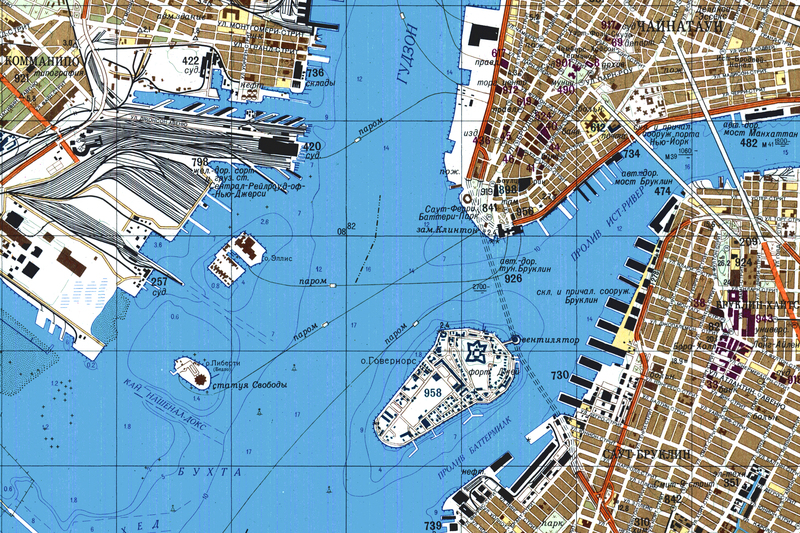 The Soviet maps of US and European cities have details that aren’t on domestic maps made around the same time, things like the precise width of roads, the load-bearing capacity of bridges, and the types of factories. They’re the kinds of things that would come in handy if you’re planning a tank invasion. Things that would be virtually impossible to find out without eyes on the ground. Given the technology of the time, the Soviet maps are incredibly accurate. Even today, the US State Department uses them (among other sources) to place international boundary lines on official government maps. 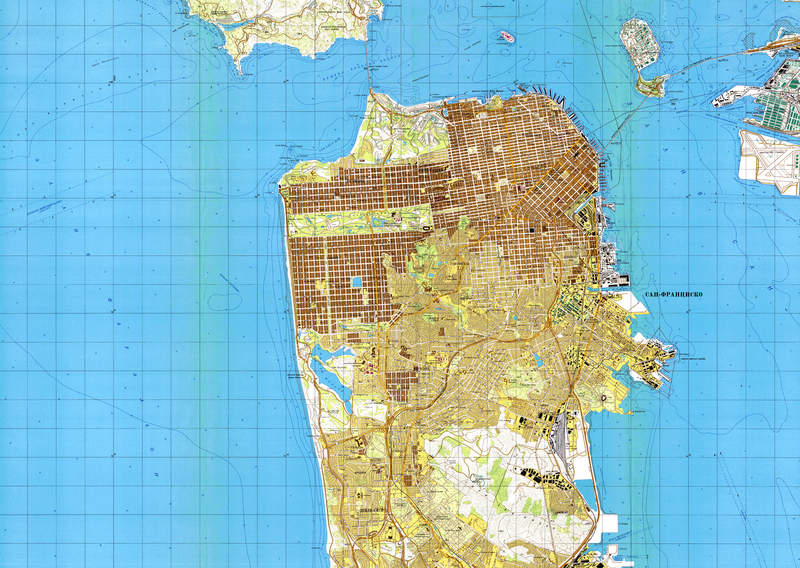 Guy’s company, Omnimap, was one of the first to import Soviet military maps to the West. Like the military officials charged with guarding the maps, map dealers around the world saw an opportunity. Maps that were once so secret that an officer who lost one could be sent to prison (or worse) were bought by the ton and resold for a profit to governments, telecommunications companies, and others. “I’m guessing we bought a million sheets,” Guy says. University libraries at places like Stanford, Oxford, and the University of Texas in Austin have drawers stuffed with Cold War Soviet maps, acquired from Guy and other dealers, but the maps have languished in obscurity. Very few academics have seen them, let alone studied them. Whatever stories they have to tell are hidden in plain sight. But one unlikely scholar, a retired British software developer named John Davies, has been working to change that. 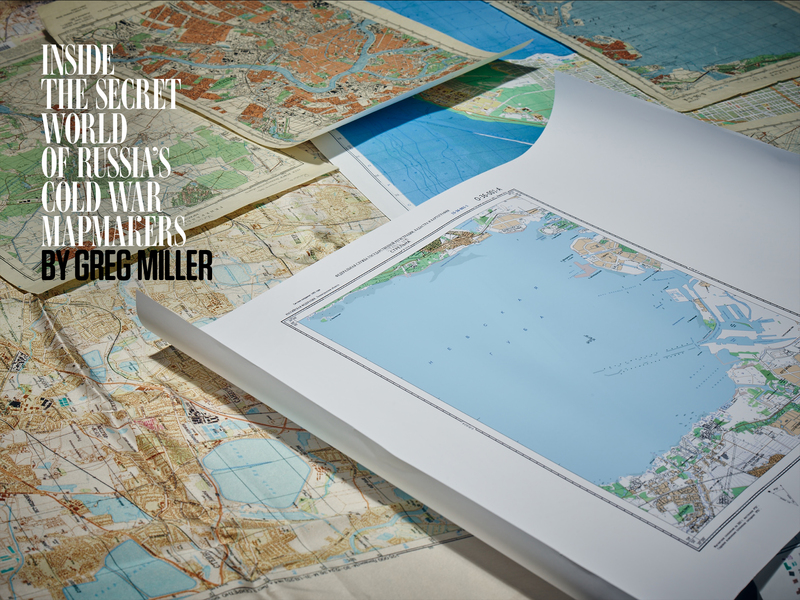 For the past 10 years he’s been investigating the Soviet maps, especially the ones of British and American cities. He’s had some help, from a military map librarian, a retired surgeon, and a young geographer, all of whom discovered the maps independently. They’ve been trying to piece together how they were made and how, exactly, they were intended to be used. The maps are still a taboo topic in Russia today, so it’s impossible to know for sure, but what they’re finding suggests that the Soviet military maps were far more than an invasion plan. Rather, they were a framework for organizing much of what the Soviets knew about the world, almost like a mashup of Google Maps and Wikipedia, built from paper. A 1980 Soviet map of San Francisco, California. DAVIES HAS PROBABLY spent more time studying the Soviet maps than anyone else. An energetic widower in his early 70s, he has hundreds of paper maps and thousands of digital copies at his house in northeast London, and he maintains a comprehensive website about them. “I was one of those kids who at 4 is drawing maps of the house and garden,” he told me when we spoke for the first time, last year. It was on a consulting trip to Latvia in the early 2000s that he stumbled on a trove of Soviet maps in a shop near the center of the capital city, Riga. Davies struck up a friendship with one of the owners, a tall, athletic man named Aivars Beldavs, and bought an armload of Soviet maps from him every time he was in town. Back home he’d compare the Soviet maps to the maps made around the same time by the Ordnance Survey, the national mapping agency, and other British government sources. He soon spotted some intriguing discrepancies. In Chatham, a river town in the far southeast, a Soviet map from 1984 showed the dockyards where the Royal Navy built submarines during the Cold War—a region occupied by blank space on contemporary British maps. The Soviet map of Chatham also includes the dimensions, carrying capacity, clearance, and even the construction materials of bridges over the River Medway. In Cambridge, Soviet maps from the ’80s include a scientific research center that didn’t appear on Ordnance Survey maps till years later. Davies started compiling lists of these differences, and on his trips to Latvia, he started asking Beldavs more questions. Beldavs, it turns out, had served in the Soviet Army in the mid-’80s, and he used the secret military maps in training exercises in East Germany. A signature was required before a map could be checked out for an exercise, and the army made sure every last one got returned. “Even if it gets destroyed, you need to bring back the pieces,” Beldavs says. A few years after he got out of the army, Beldavs helped start the map shop, Jana Seta, which sold maps mainly to tourists and hikers. As he tells it, officers at the military cartographic factories in Latvia were instructed to destroy or recycle all the maps as the Soviet Union dissolved in the early ’90s. “But some clever officers found our company,” he says. An offer was made, a deal was struck, and Beldavs estimates the shop acquired enough maps to fill 13 rail cars. At first they didn’t have enough space to store them all. One time, some local kids tried to set fire to a pallet load of maps they’d left outside. But the vast majority of them survived unscathed. 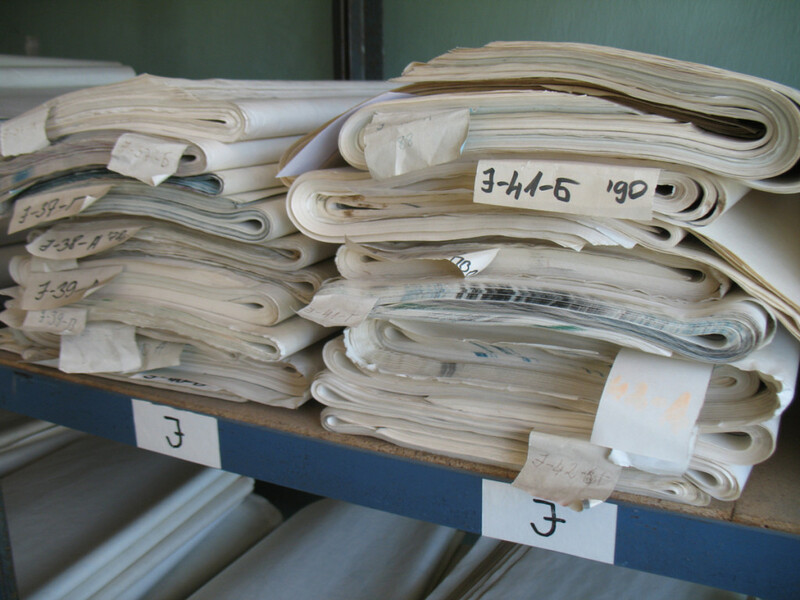 Soviet maps stacked up in Aivars Beldavs’ map shop in Latvia. “These maps were very interesting for the local people,” Beldavs says. Indeed, not all maps were created equal in the USSR. While the military maps were extremely accurate, the maps available to ordinary citizens were next to useless. In a remarkable 2002 paper in a cartographic journal, the eminent Russian cartographer and historian of science, Alexey Postnikov, explains why this was so. “Large-scale maps for ordinary consumers had to be compiled using the 1:2,500,000 map of the Soviet Union, with the relevant parts enlarged to the needed scale,” he wrote. That’s like taking a road map of Texas and using a photocopier to enlarge the region around Dallas. You can blow it up all you want, but the street-level details you need to find your way around the city will never be there. Worse, the maps for the masses were deliberately distorted with a special projection that introduced random variations. “The main goal was to crush the contents of maps so it would be impossible to recreate the real geography of a place from the map,” Postnikov tells me. Well-known landmarks like rivers and towns were depicted, but the coordinates, directions, and distances were all off, making them useless for navigation or military planning, should they fall into enemy hands. The cartographer who devised this devious scheme was awarded the State Prize by Stalin. While the newly available Soviet military maps had practical value for people inside the former republics, for Davies they brought back a bit of Cold War chill. Anyone old enough to have lived through those paranoid days of mutually assured destruction will find it a bit disturbing to see familiar hometown streets and landmarks labeled in Cyrillic script. The maps are a rare glimpse into the military machine on the other side of the Iron Curtain. The Soviet maps were just a casual hobby for Davies until he met David Watt, a map librarian for the British Ministry of Defence, in 2004. Watt, it turns out, had encountered Beldavs years earlier and done some investigations of his own. 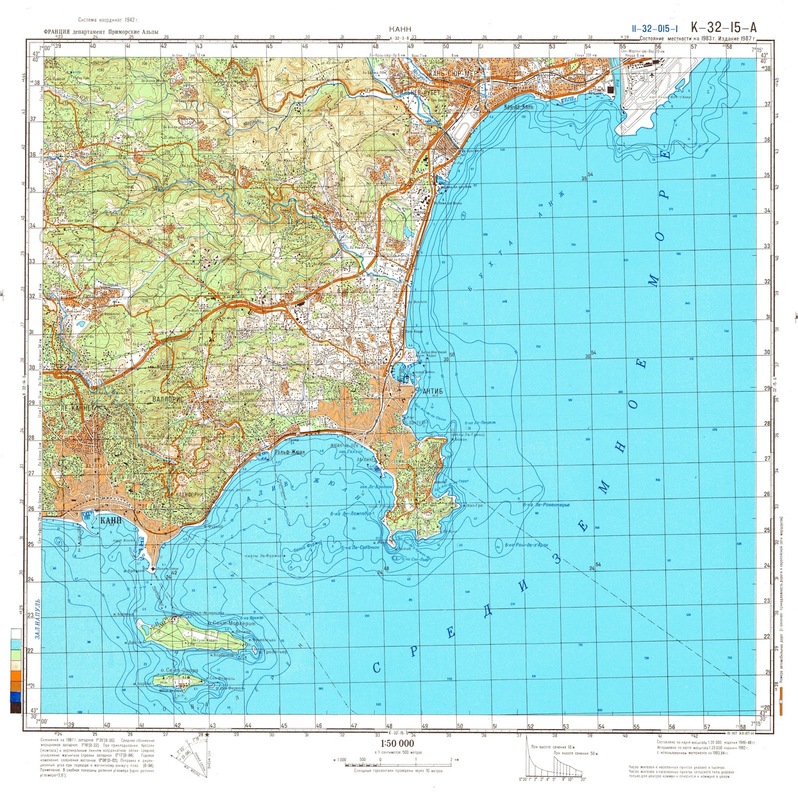 At a cartography conference in Cologne, Germany, in 1993, Watt had picked up a pamphlet from Beldavs’ shop advertising Soviet military topographic maps and city plans. “If they really were Soviet military city plans, then these were items which four years before were so highly classified that even squaddies in the Red Army were not allowed to see them,” he later recalled. A few weeks later a package was waiting for him at the airport. Inside were the maps he’d ordered—and a bunch more Beldavs had thrown in. Over the next few years, Watt pored over these maps and picked up others from various dealers. The scope of the Soviet military’s cartographic mission began to dawn on him. They had mapped nearly the entire world at three scales. The most detailed of these three sets of maps, at a scale of 1:200,000, consisted of regional maps. 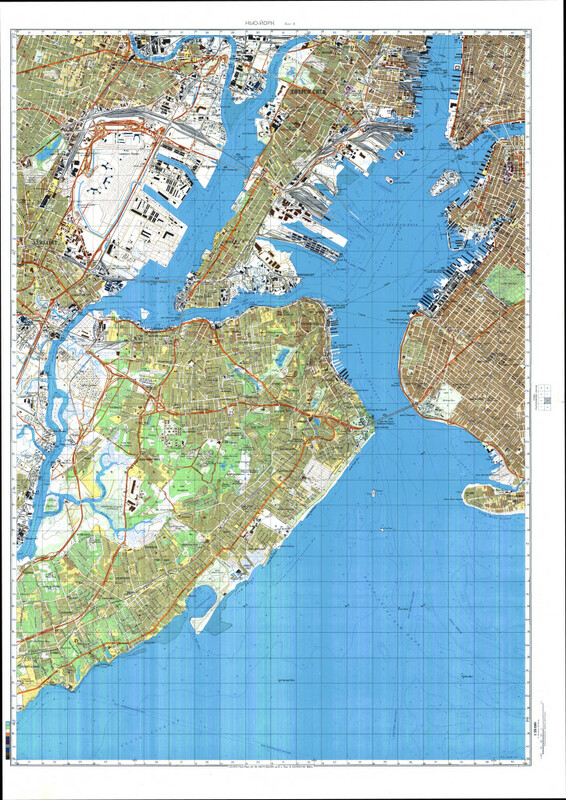 A single sheet might cover the New York metropolitan area, for example. The Soviets made far more detailed maps of some parts of the world. They mapped all of Europe, nearly all of Asia, as well as large parts of North America and northern Africa at 1:100,000 and 1:50,000 scales, which show even more features and fine-grained topography. Another series of still more zoomed-in maps, at 1:25,000 scale, covers all of the former Soviet Union and Eastern Europe, as well as hundreds or perhaps thousands of foreign cities. At this scale, city streets and individual buildings are visible. The Soviets produced hundreds of remarkably detailed 1:10,000 maps of foreign cities, mostly in Europe, and they may have mapped the entire USSR at this scale, which Watt estimated would take 440,000 sheets. 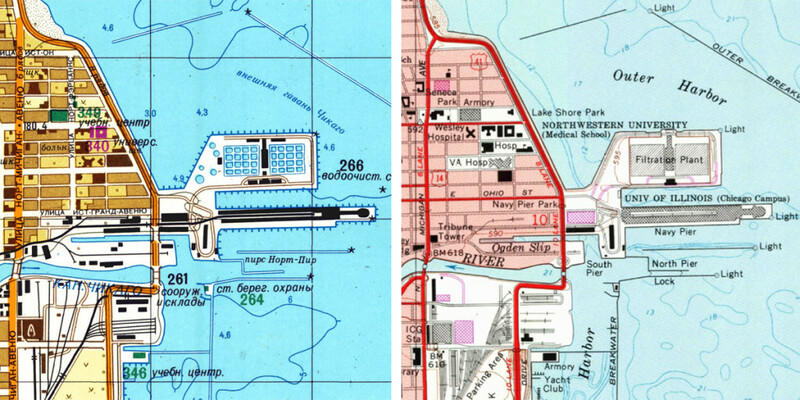 A 1980 Soviet map of San Diego naval facilities (left) compared with a US Geological Survey map of the same area, from 1978 (revised from 1967). In 2004 he presented some of his research at a meeting of the Charles Close Society, a group devoted to the study of Ordnance Survey maps. Davies was in the audience. The two men spoke, and Watt encouraged Davies to study them more seriously. Around the same time, Watt and Davies met two other men who’d also become intrigued by the Soviet maps: John Cruickshank, a retired surgeon from Leeds, and Alex Kent, a geography graduate student at Canterbury Christ Church University. “It really all snowballed from there,” Watt says. For Davies, the new friends and their shared interest came as a welcome distraction in an emotionally difficult time: His wife of nearly four decades was dying of cancer. In 2006, Davies organized a research trip to Latvia. The group spent several days in Riga, poring over Soviet military maps at Beldavs’ shop and visiting a cartographic factory that had made civilian maps during the Soviet era. Not that the trip was all work—it coincided with the Latvian midsummer festival, an all-night affair involving folk songs and dancing, fueled by copious helpings of beer and wild boar sausage. “It was an absolute hoot,” Watt recalls. 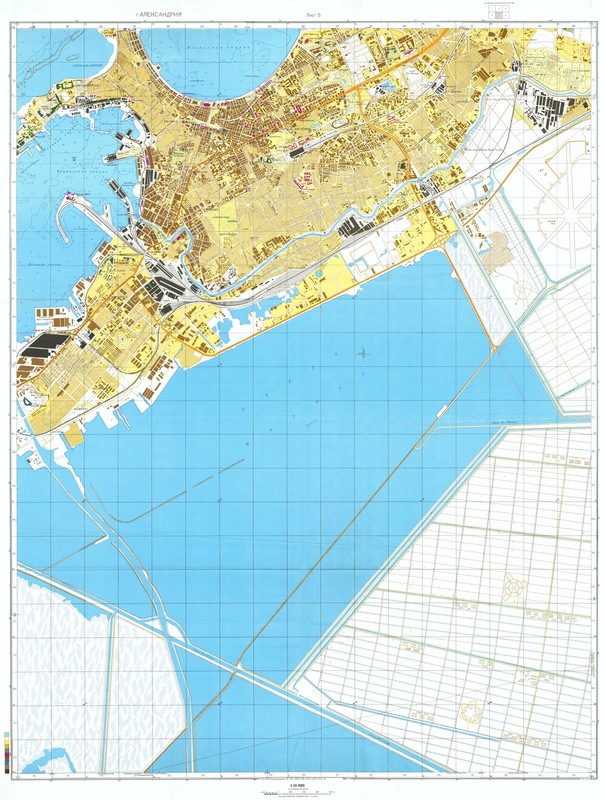 Soviet map of Staten Island and, in the upper right, Lower Manhattan, from 1982. The details include dimensions and building materials of the bridges. In post-war Russia, men died in the pursuit of better maps. After World War II, Stalin ordered a complete survey of the Soviet Union. Though aerial photography had reduced the need for fieldwork by then, it didn’t eliminate it entirely, according to the 2002 paper by Alexey Postnikov, the Russian cartographer. Survey teams endured brutal conditions as they traversed Siberian wilderness and rugged mountains to establish networks of control points. A surveyor himself, Postnikov writes that on a survey expedition to remote southern Yakutiya in the 1960s he found a grim note scrawled on a tree trunk by one of his predecessors. It’s dated November 20, 1948. “All my reindeer have perished,” it begins. The stranded surveyor says he will attempt to force his way to the River Gynym, a sparsely populated area at least 200 kilometers away. Given that temperatures in Yakutiya rarely rise above –4 degrees Fahrenheit in the winter, Postnikov doubts they made it. Stalin’s successor, Nikita Khrushchev, saw fertile ground for the spread of communism in a world in which former European colonies were quickly gaining their independence, says Nick Baron, a historian at the University of Nottingham. “Khrushchev was exhilarated by the prospect of winning over these newly liberated countries in Africa, South Asia, and so on,” Baron says. 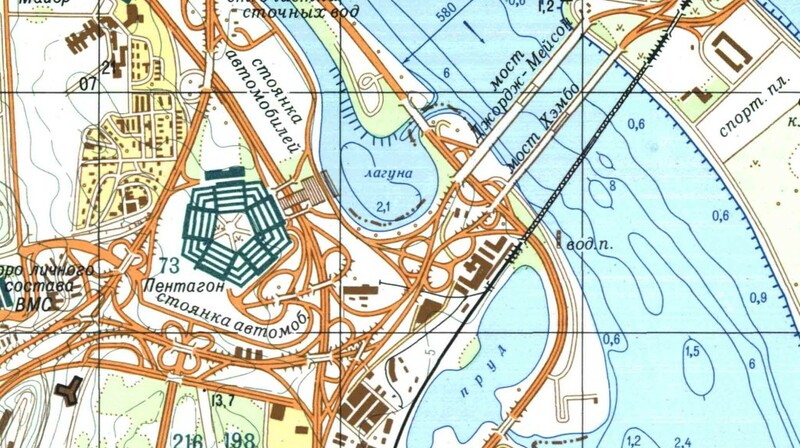 A detail of a 1975 map showing the Pentagon. Postnikov estimates that the military mapping program involved tens of thousands of surveyors and topographers, the people who go out into the field and gather data on relief and other features, and hundreds of cartographers who compiled these data to make the maps. During the Cold War he served in a parallel civilian cartographic corps that made maps for engineers and planners. These maps were far better than the bogus ones produced for the proletariat, accurate enough to be used for building roads and other infrastructure, but stripped of any strategic details that could aid the enemy if they were captured. The civilian cartographers were well aware that the military was busily mapping foreign territories, Postnikov says. How many maps did the military cartographers make? The US military made maps during the Cold War too, of course, but the two superpowers had different mapping strategies that reflected their different military strengths, says Geoff Forbes, who served in the US Army as a Russian voice interceptor during the Cold War and is now director of mapping at Land Info, a Colorado company that stocks Soviet military maps. “The US military’s air superiority made mapping at medium scales adequate for most areas of the globe,” Forbes says. As a result, he says, the US military rarely made maps more detailed than 1:250,000, and generally only did so for areas of special strategic interest. “The Soviets, on the other hand, were the global leaders in tank technology,” Forbes says. After suffering horrific losses during the Nazi ground invasion in WWII, the Soviets had built up the world’s most powerful army. Maneuvering that army required large-scale maps, and lots of them, to cover smaller areas in more detail. “One to 50,000 scale is globally considered among the military to be the tactical scale for ground forces,” Forbes says. A manual produced by the Russian Army, translated and published in 2005 by East View, a Minnesota company with a large inventory of Soviet maps, gives some insight into how the topographic maps could be used in planning or executing combat operations. It includes tables on the range of audibility of various sounds (a snapping twig can be heard up to 80 meters away; troop movements on foot, up to 300 meters on a dirt road or 600 meters on a highway; an idling tank, up to 1,000 meters; a rifle shot, up to 4,000 meters). Other tables give the distances for visual objects (a lit cigarette can be visible up to 8,000 meters away at night, but you’d have to get within 100 meters to make out details of a soldier’s weaponry in daylight). Still more tables estimate the speed at which troops can move depending on the slope of the terrain, the width and condition of the roadway, and whether they are on foot, in trucks, or in tanks. The maps themselves include copious text with detailed descriptions of the area they depict, everything from the materials and conditions of the roads to the diameter and spacing of the trees in a forest to the typical weather at different times of year. To make these maps of foreign territory, the Soviets started with official, publicly available maps from sources like the Ordnance Survey or the US Geological Survey. John Davies has found, for example, that elevation markers on maps of Britain often appear at exactly the same points and work out to be exact metric equivalents of the British units. 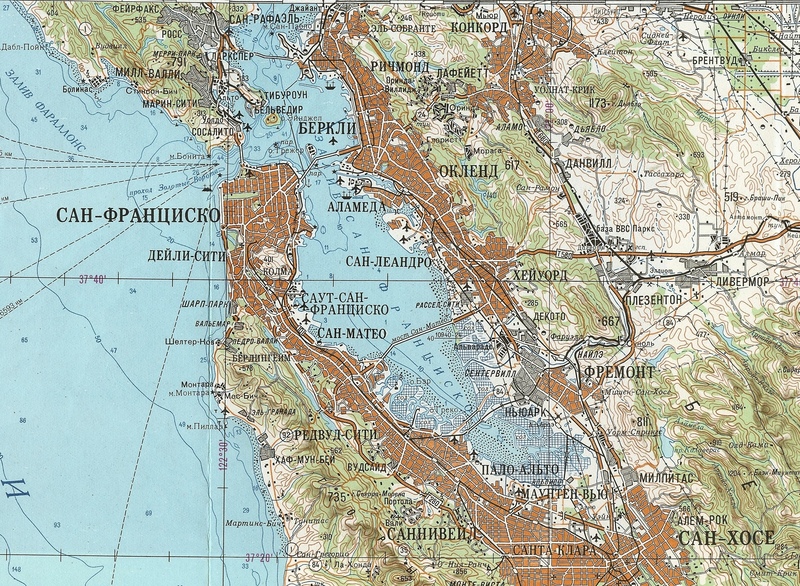 “When I joined the USGS in 1976, I heard the then commonly-told story about a representative from the Soviet embassy in Washington obtaining the initial copy of the paper-print National Atlas, prepared by the USGS in cooperation with a number of other agencies, when it was offered for public sale in 1970,” USGS geologist and historian Clifford Nelson told me in an email. Nelson added that it seems logical that Soviet representatives would have acquired 1:24,000-scale topographic maps from the US as they were printed, but he says he knows of no paper trail that could confirm that. Despite the Ordnance Survey’s copyright claim, Davies argues that the Soviet maps aren’t mere copies. In many places, they show new construction—roads, bridges, housing developments, and other features that don’t appear on contemporary Ordnance Survey maps. Many of these details, Davies argues, came from aerial or satellite reconnaissance (the first Soviet spy satellite, Zenit, was launched into orbit in 1962). Other details, such as notes on the construction materials and conditions of roadways and bridges, seemingly had to come from agents on the ground (or, according to one account from a Swedish counterintelligence officer, by picnicking Soviet diplomats with a preference for sites near objects of strategic interest). 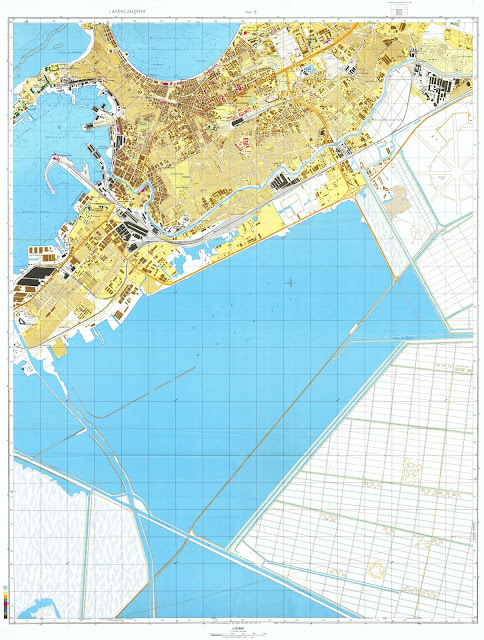 Unlike the 1984 US Geological Survey map of Chicago’s lakefront, the 1982 Soviet map shows individual buildings in the city and structures on Navy Pier. Not that the Soviet maps are infallible. There are curious mistakes here and there: Earthworks for a new pipeline in Teesside in the UK are mistaken for a road under construction, a nonexistent subway line connects the Angel and Barbican stations in London. The town of Alexandria appears (correctly) in northern Virginia, but a town of the same name also appears (incorrectly) outside of Baltimore. Defunct railways and ferry routes persist on editions of the Soviet maps for years after they’ve been discontinued. There are other puzzles too. The Soviets mapped a handful of American cities at a scale of 1:10,000. These are detailed street-level maps, but they don’t focus on places of obvious strategic importance. Economic rather than military objectives may have motivated the Soviets to map these cities in detail, suggests Steven Seegel, an expert on Russian political and intellectual history at the University of Northern Colorado. The Soviets admired US postwar economic prosperity and wanted to understand how it worked, Seegel says. “These cities might have been on their radar for their reputation for heavy industry, shipping, or logistics,” Seegel says. Pontiac had a General Motors plant, for instance, and Galveston was a major port. Scranton had a huge coal mine. Other towns were close to hydropower plants. “There was an obsession in the Soviet era over power grids and infrastructure” that went beyond their military implications, Seegel says. 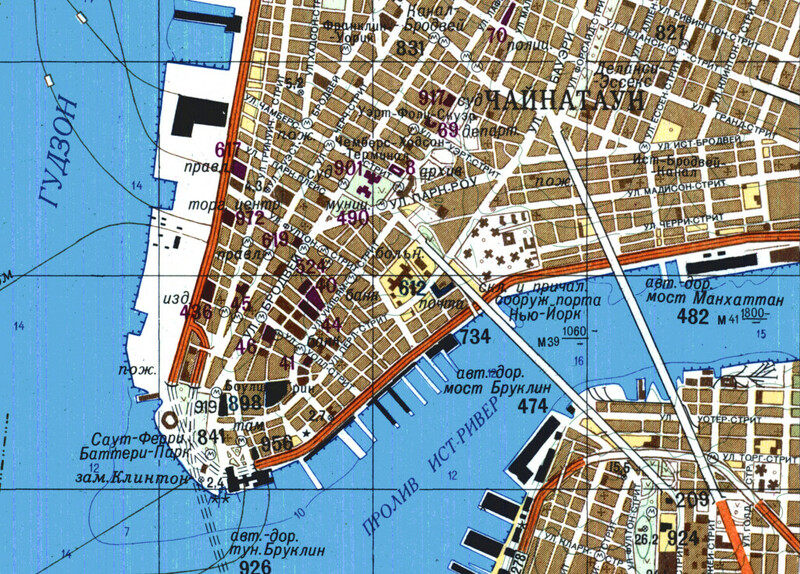 John Davies has found scores of features on the Soviet maps that don’t seem to have immediate military relevance, things like factories, police stations, and transportation hubs. “If it’s an invasion map, you wouldn’t show the bus stations,” Davies says. That’s probably true, but there may be even more to it than that, says Alex Kent, who’s now a senior lecturer in geography at Canterbury Christ Church University. Kent thinks the Soviets used the maps more broadly. “It’s almost like a repository of intelligence, a database where you can put everything you know about a place in the days before computers,” he says. “They managed to turn so much information into something that’s so clear and well-presented,” Kent says. Aesthetically, the maps are striking, if not beautiful. The cartographers who made them took tremendous pride in their work, down to the last details, says Kent Lee, the CEO of EastView Geospatial, a Minnesota company that was once Russell Guy’s main competition in the Soviet map import business and now claims to have the largest collection of Soviet military maps outside of Russia. “Cartographic culture is to Russia as wine culture is to France,” Lee says. RUSSELL GUY DOESN’T sell many Soviet maps these days. But for a while there in the ’90s, he says, business was booming. Telecommunications companies bought them up as they were building cell phone networks across Africa or Asia. If you’re building cell phone towers, Guy explains, you need to know the terrain, and the Soviet topographic maps were often the best source available in less developed parts of the world. He says he could tell which countries were soliciting bids at any given time because as soon as one company ordered a set of Soviet topo maps, three or four others would call up to order the same thing. The US government was another big buyer. Intelligence analysts used the Soviet maps in Afghanistan in the early 2000s, says Ray Milefsky, a former geographer and geospatial analyst at the US military’s Defense Mapping Agency (now called the National Geospatial-Intelligence Agency). Milefsky later moved to the State Department, where he specialized in determining where international boundaries should be drawn on official government maps. The Soviet maps were—and continue to be—one of the best sources, says Milefsky, who retired in 2013. The boundary lines on the Soviet maps are so accurate because the cartographers went back to the original treaties and reconciled the landmarks mentioned there with survey reports and boundary markers on the ground. “When we first got them it was a gold mine, especially for aligning the boundaries of the former Soviet republics,” Milefsky says. But with the proliferation of satellite mapping in recent years, the Soviet maps aren’t selling like they used to, Guy and other dealers say. Once in a while a telecom or avionics company will order a set. Sometimes an adventure travel company will buy a few. Geologists and other academics sometimes use them. A team of archaeologists recently used the Soviet maps to study the destruction of prehistoric earthen mounds by encroaching agriculture in Central Asia. Even so, military maps are still a touchy topic in Russia. As recently as 2012, a former military topographic officer was sentenced to 12 years in prison for allegedly leaking classified maps to the West. 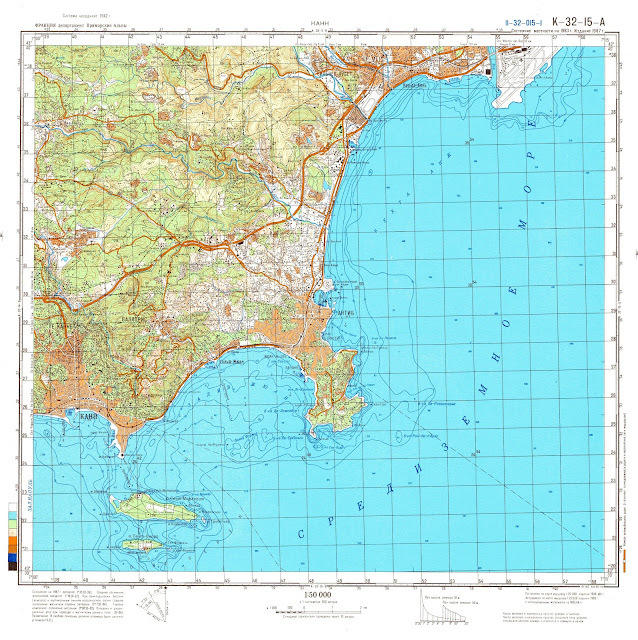 John Davies and Alex Kent gave a presentation of their research at an international cartography meeting in Moscow in 2011, hoping to meet Russian cartographers or scholars who knew about the maps or perhaps had even worked on them. They thought maybe someone might come up after their talk or approach them at happy hour. “The silence was quite disconcerting,” Kent says. For Guy, the maps are a reminder of a time when a map dealer from a small company in North Carolina got a tiny taste of the 007 lifestyle. He and other dealers who brought the maps to the West still have vivid memories of clandestine meetings in dark Moscow bars, being trailed by KGB agents (who else could it be? ), and worrying about who was listening in on their phone calls. They still dodge questions about their old military connections. They don’t want to stir up trouble. Even now, the paranoia is hard to shake. The accord, also signed in Oslo by the ambassadors of Canada, Norway and Denmark, is a response to global warming, which is melting sea ice in the central Arctic Ocean, an area the size of the Mediterranean. The deal had been delayed by more than a year by tensions over Ukraine. The central Arctic probably has no commercial fish stocks now, experts say, but melting sea ice may draw fish such as cod farther north. Forty percent of the area was briefly open water when summer sea ice shrank to a record low in 2012. The deal “will prevent a problem from arising ahead of time,” said David Balton, US deputy assistant secretary of state for oceans and fisheries. “Climate change is affecting the migration patterns of fish stocks,” Norwegian foreign minister Boerge Brende said in a statement. He said Arctic states had a responsibility to protect the international waters, starting 200 nautical miles (230 miles) from their coasts. Thursday’s accord was negotiated in outline in Greenland in February 2014, to be signed in June 2014. But Russian president Vladimir Putin annexed Ukraine’s Crimea region in March 2014, and in protest, both the United States and Canada boycotted one meeting of the Arctic Council last year in Moscow. That protest “was the exception to the rule” of cooperation in the Arctic, Balton said. Many other Arctic activities have remained on track with Russia, such as exercises linked to search and rescue and oil spills. “It’s a new ocean emerging,” said Scott Highleyman, director of international Arctic affairs at the Pew Charitable Trusts environmental group. 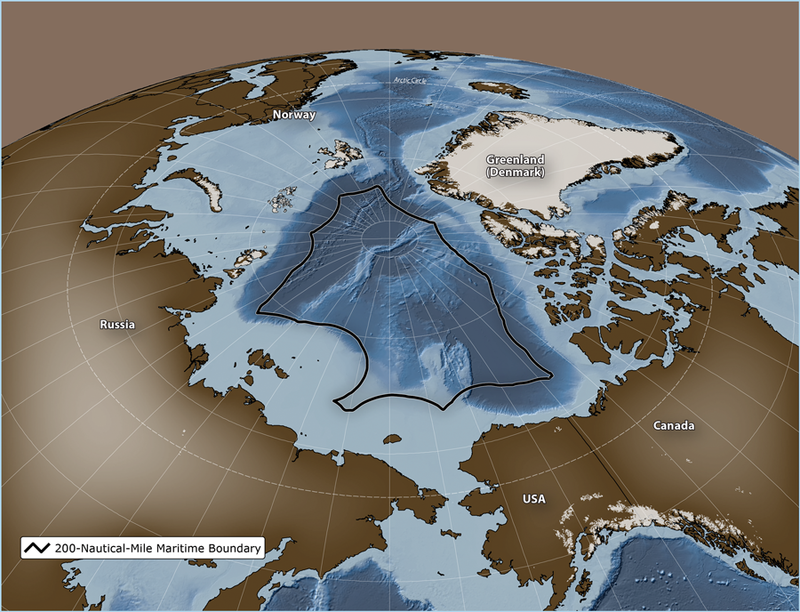 The Chukchi sea near Shishmaref, Alaska, is part of the Arctic Ocean. The Arctic thaw is also opening the region to more oil and gas exploration and shipping. The United States, the current chair of the eight-nation Arctic Council that includes Russia, plans to host an oil spill exercise in 2016. The Wendy Schmidt Ocean Health XPRIZE promises to improve our understanding of how CO2 emissions are affecting ocean acidification, with breakthrough sensors that can help us begin the process of healing our oceans. I am an avid sailor, inspired not only by the visual beauty of the ocean and its vast power, but also by the practical (and potentially lifesaving) information that allows me to sail - the data on currents, winds and waves. It's the ocean we cannot see, but can measure. Sailors have relied on this information for centuries, and as technology has improved, our ability to gather it has also improved. Gathering data near the ocean's surface, where we can see and feel it, is relatively straightforward. The real challenge is grasping what's going on under the surface, out of sight. We often hear about changes occurring in the ocean, such as warming, overfishing, pollution and ocean acidification. But how do we know exactly what's going on without dependable information? Our understanding of the ocean is limited because there are numerous difficulties in collecting data. Primarily, it's often very expensive; researchers can pay $10,000 or more per day simply to travel to the place where they want to gather information. But beyond the expense, gathering data in the rough ocean environment can be time-consuming and physically difficult. For many reasons, water samples from different depths have to be collected and brought up to the surface for analysis in labs, and it can be difficult to preserve the integrity of these samples. Part of the reason for creating the Wendy Schmidt Ocean Health XPRIZE was to address some of these challenges in gathering data about the ocean. I want to spur innovation in pH sensors because we need more information on ocean acidification in varying coastal environments and at depth. For the ocean, I want sensors that are accurate, durable, affordable and easy to use. The Wendy Schmidt Ocean Health XPRIZE was launched in September 2013. The competing sensors were put through three progressively difficult tests: one in pristine lab conditions, one in coastal waters, and one in the deep ocean - down to 3,000 meters (or almost two miles below the ocean's surface where I sail). The finalist teams have developed pH sensors that can make measurements as accurate as water samples analyzed in a lab. Their sensors are affordable and durable, and have shown that they can withstand the high pressures of the deep ocean and operate for a month or longer in rugged coastal locations. Sunburst Sensors strives to provide its customers high-quality chemical sensors for marine and freshwater applications. The SAMI-CO2 and SAMI-pH (Submersible Autonomous Moored Instrument) have been deployed by researchers around the world interested in long term monitoring of pCO2 and pH. Today, as we celebrate this leap in our ability to gather more data on ocean acidification, I also celebrate that the technological innovations that came out of this competition could potentially be applied to other ocean sensors. We challenged our teams to develop sensors that go deeper and continue working in difficult environments. We challenged them to produce cheaper sensors. We challenged them to make it easier to collect data about the oceans so we can be better stewards. In applying our technical expertise to the ocean, it's possible to get good quality data and more of it. Armed with that information, we will be better equipped to address the many other challenges the ocean is facing. We will be able to tell if there is a change, and the magnitude of that change. With more data, we will be able to understand, and with that understanding, we can help the oceans. And in helping the oceans, we will be helping the planet - and ourselves - to a healthier life, because it's all connected. Mick Fanning’s close shave with a shark while competing in South Africa is likely to amplify mutterings from some ocean-goers over what they perceive as a dangerous escalation in shark numbers. Any flurry of shark attacks spurs calls for something to be done. 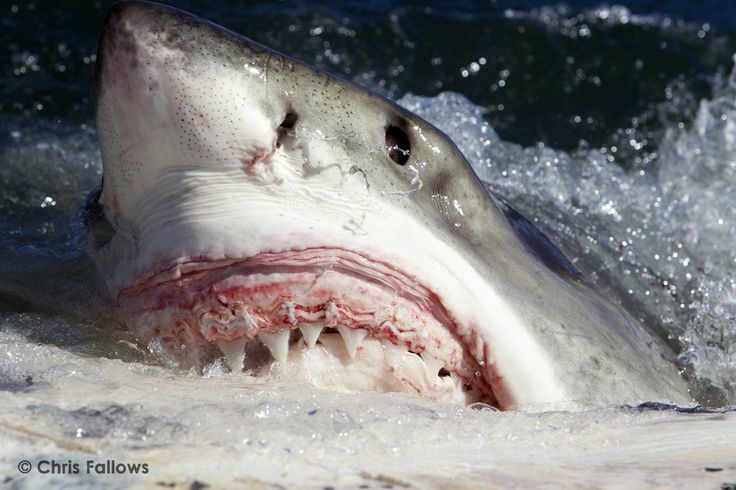 Already in 2015, there have been 13 unprovoked attacks by sharks, causing one fatality, in Australia. This is fairly unusual – there’s only been one year over the past decade with more than 14 attacks. In the US, eight people have been attacked off the coast of North Carolina since the start of June. In one incident, a 12-year-old girl had her arm and part of her leg bitten off, while a 16-year-old boy had to have his arm amputated. These incidents have led to a string of untested theories, with the North Carolina attacks blamed upon a change in water temperature that attracted a large group of migrating warm-water sharks, such as bull and tiger sharks. In Australia, some surfers say shark numbers are exploding and that they are looking for food closer to shore. “Anecdotally, surfers and fishermen across the country have been reporting that the size and abundance of large sharks are ­noticeably higher than they’ve been, in some places, for 30 years,” the Australian newspaper has stated. Humans’ fear of sharks can be seen in the shark nets erected in parts of South Africa, New South Wales and Queensland, as well as the baiting and shooting program in Western Australia that was scaled down following an outcry from environmentalists and scientists. 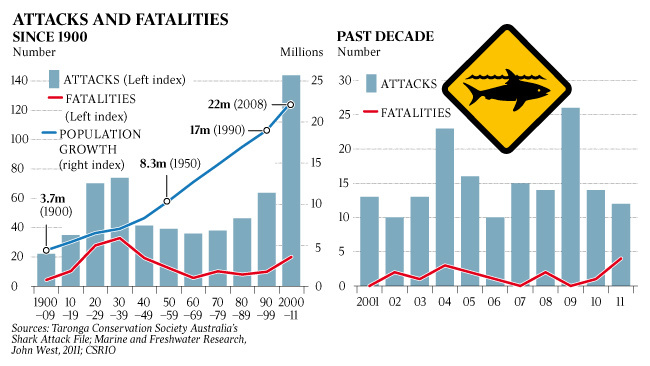 So far, 2015 looks set to be on the higher side in numbers of global shark attacks. Last year, there were 72 unprovoked shark attacks in the world, leading to three deaths, according to the University of Florida, which collates shark attack statistics. There were 83 attacks in 2012 – the highest in the past decade – but it’s unclear whether there has been a sharp increase in attacks once population growth and improved record-keeping are factored in. Australia had 120 attacks between 2000 and 2009 – more than double that of any other decade on record since 1900. But when attacks per million people are considered, the picture is far less scary, with the trend dipping down from the 1930s, albeit with a slight rise in the past decade. Distribution of shark attacks in Australia between 1900 and 2009, including total number of attacks, the total population of Australia and the shark attacks per million people. The Taronga Conservation Society, which collated this data, states that there have been 15 incidents a year, on average, over the past decade, compared with 6.5 annual incidents from 1990 to 2000. But this increase in attacks, the society says, “coincides with an increasing human population, more people visiting beaches, a rise in the popularity of water-based fitness and recreational activities and people accessing previously isolated coastal areas. Further research, published in the Australian Medical Journal last year, cites an increase in whale numbers as contributing to a spate of shark attacks on people off the Western Australian coast. The risk for bathers less than 25m from shore is, however, “likely to remain very low, and well below the risk of other recreational activities undertaken in WA”, the journal states. Other scientists back up this view – an increase in attacks must be seen in the context of increasing numbers of people in the sea, while shark populations are hard to pin down. The idea of hordes of vengeful sharks is fanciful. “Your toaster is more likely to kill you than a shark,” said Culum Brown, a fish biologist at Macquarie University. “It is extremely unlikely that you will ever be, or even know, a shark attack victim. Sharks are fast moving, cryptic animals. Studying them is expensive, but what we do know about them shouldn’t be overly alarming, Brown said. 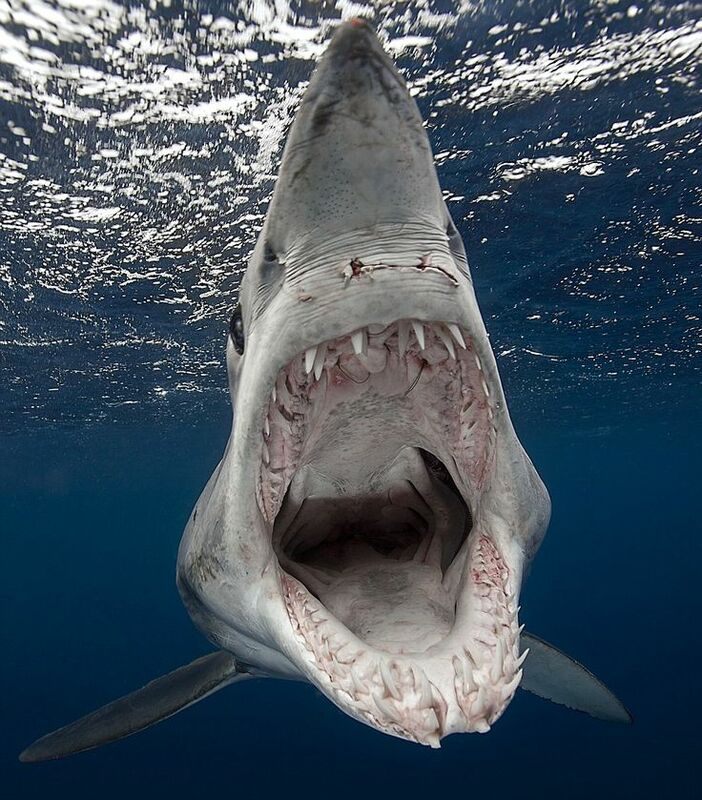 The chances of being attacked are extremely small and those who are attacked are predominantly targeted around the legs, suggesting that sharks are exploring their potential prey rather than devouring it. “We do know that sharks don’t like to eat people,” he said. “Studies show they respond strongly to the smell of seals and fish, but not humans. The trouble with sharks is that they are inquisitive and when checking out a potential prey item they typically come up and have a nibble. Unlike whales, sharks are hard to count. But most scientists doubt the idea that protecting species such as great whites has resulted in their numbers ballooning, pointing out that an estimated 100m a year are killed worldwide, often for the shark fin soup market. “The shark attack debate is a bit like the climate change debate,” said Dr Daniel Bucher, a marine ecologist at Southern Cross University. “You can focus on the background noise or you can look at the long-term trend. Bucher said research shows shark attacks can be influenced by rainfall and whether swimmers or surfers are near river mouths or fish feeding areas. The film crew tags a number of great white sharks to study their movement patterns along Australia's coast. When one of the devices washes ashore, could a killer whale be to blame? Interactions with sharks also vary – sharks generally pass people without a second thought, although being in a group of people and turning to face the shark rather than thrashing around wildly in an attempt to move away can help. But sharks have been evolving as awe-inspiring predators for at least 455 million years, and much more work is required to know exactly what triggers attacks. Bucher said two incidents – one fatal, one not – off the coast of Byron Bay in February, showed there are no hard and fast rules when it comes to shark attacks. Gambling on a better life, the stowaways had run out of luck. They had already spent nine days at sea, most of the time hiding in the Dona Liberta’s engine room, crouched deep in oily water. But as they climbed down onto the slick raft, the men, neither of whom knew how to swim, nearly slid into the ocean before lashing themselves together to the raft with a rope. 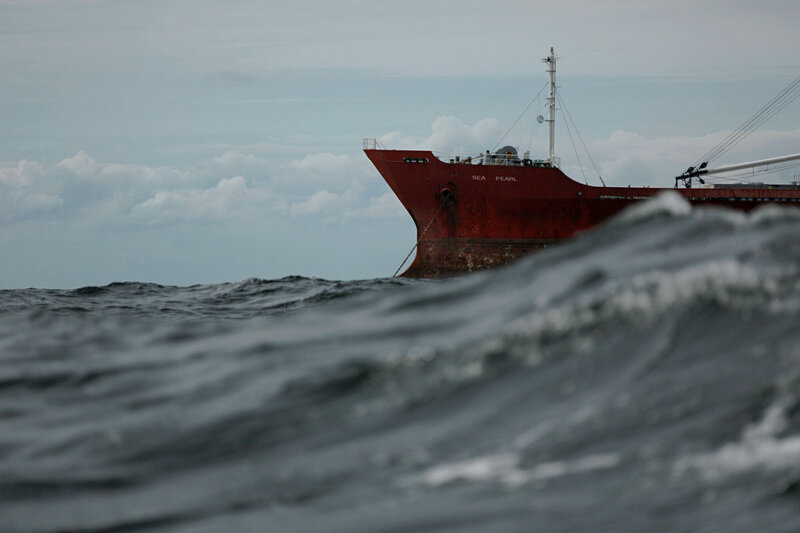 Few places on the planet are as lawless as the high seas, where egregious crimes are routinely committed with impunity. Through debt or coercion, tens of thousands of workers, many of them children, are enslaved on boats every year, with only occasional interventions. On average, a large ship sinks every four days and between 2,000 and 6,000 seamen die annually, typically because of avoidable accidents linked to lax safety practices. Ships intentionally dump more engine oil and sludge into the oceans in the span of three years than that spilled in the Deepwater Horizon and Exxon Valdez accidents combined, ocean researchers say, and emit huge amounts of certain air pollutants, far more than all the world’s cars. Commercial fishing, much of it illegal, has so efficiently plundered marine stocks that the world’s population of predatory fish has declined by two thirds. The Dona Liberta has been among the most persistent of scofflaws, offering a case study of misconduct at sea, according to an examination of shipping, insurance and port records, and dozens of interviews with law enforcement, maritime experts and former company associates. The vessel not only cast off stowaways — Jocktan Francis Kobelo, the second man ordered onto the raft, died from the 2011 ordeal — but has also been accused of a long list of other offenses over the past decade. 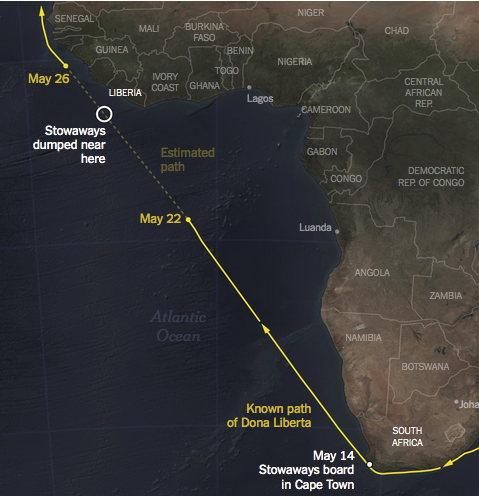 From 2011 to 2014, the rusty refrigerated cargo vessel traced the coasts of Africa and Europe, abandoning crew members, abusing stowaways, dumping oil and committing other crimes along the way. Port calls were often the only means of locating the ship, which frequently turned off its required satellite tracking signal. As the rusty refrigerator ship moved across two oceans and five seas and among 20 ports, it routinely abused, cheated and abandoned its crew, caused an oil slick nearly 100 miles long, and drew citations from a half-dozen countries for other environmental violations. Creditors chased its owner for millions of dollars in unpaid debts, and maritime watchdog groups listed its parent company as an illegal fishing suspect. Still, the ship operated freely and never lacked for work or laborers. Vessels that disappear over the horizon tend to vanish not just from sight but from oversight, a New York Times investigation found. Countries have signed dozens of maritime pacts, the shipping industry has published reams of guidelines and the United Nations maritime agency has written hundreds of rules, all aimed at regulating ships, crews and safety. But those laws are also often weak, contradictory and easily skirted by criminals. National and international agencies usually have neither the inclination nor resources to enforce them. Usually, a ship may be stopped on the high seas only by a law enforcement or military vessel flying the same flag. The world’s navies, though, have been scaling down for decades. Most nations, including the Bahamas, whose flag the Dona Liberta flew, have no ships that regularly patrol beyond their national waters. When wrongdoing occurs, no single agency within a country or specific international organization typically has a sufficient stake in the matter to pursue it. The stowaways on the Dona Liberta, for example, were undocumented immigrants from Tanzania, living in South Africa and brought to shore in Liberia. The ship was owned by a Greek company incorporated in Liberia, crewed primarily by Filipinos, captained by an Italian, flagged to the Bahamas and passing through international waters. “Who leads such an investigation?” Mr. Young asked. There is much at stake: A melting Arctic has expanded trade routes. Evolving technology has opened the deep seabed to new mining and drilling. Maritime rivalry and piracy have led to more violent clashes. And, with an ever more borderless economy, sea commerce is vital to many countries. “Without ships, half of the world would freeze and the other half would starve,” Rose George, a British nautical writer, said. In recent months, the United States has said that it intends to take a bigger role in high seas governance. “We ignore the oceans at our peril,” said Secretary of State John Kerry, who has pushed for more marine conservation globally and in May brokered a landmark deal with Russia to regulate trawling in Arctic waters. Mr. Young pressed for urgent action. As the storm set in, 20-foot swells seesawed the 7-by-8-foot raft. To avoid flipping over, the two Tanzanian stowaways splayed flat on their backs. Their hands chafed from grasping a piece of rebar poking up from one of the rusty blue drums. Weather is more punishing on the open water because it comes from above and below. For eight pitch-black hours, the men stared upward in a driving rain, keeping their mouths closed because waves kept washing over them and squinting because shutting their eyes intensified the seasickness. Mr. Kobelo had stowed away on ships three times before in search of work wherever he landed, according to his brother, Michael. He went to Angola, Senegal and then Singapore, where he spent a year as a night watchman and firefighter in a small dry dock. Though he could have faced prosecution, most countries do not bother to charge stowaways. Immigration authorities eventually sent him back to Tanzania. To Mr. Mndolwa, who is barely literate and had never before left Africa, Mr. Kobelo’s descriptions of his time in Singapore — free hospital visits, restaurant meals, beaches where the police never shooed him away — sounded far better than his life in Cape Town. By day, the two men roamed the sidewalks near South Africa’s Table Bay, selling knockoff watches and soccer jerseys. By night, they slept in a makeshift lean-to under a bridge. For those seeking escape, few routes are as perilous as the sea. Roughly 2,000 stowaways are caught each year hiding on ships. Hundreds of thousands more are sea migrants, whose journey involves some level of complicity from the ship’s crew. In interviews, these travelers compared the experience of stowing away at sea to hiding in the trunk of a car for an undetermined length of time, going to an unknown place across the most brutal of terrains. It is impossible to bring enough food or water. To get on board, some stowaways pose as stevedores or deck cleaners. Others swim under the stern and squeeze through a space where the rudder meets the ship. Many scale the side, helped by “stowaway poles”: long bamboo sticks with toeholds and a hook. “Love boats,” which are common in ports and deliver prostitutes, drugs and alcohol to large ships, sometimes also bring uninvited passengers. After sneaking on board, they hide in hulls or shipping containers, crane cabs or tool trunks. But concealed corners that might look inviting often turn deadly once ships set sail. Refrigerated fishing holds become cold, exhaust pipes heat up, shipping containers are sealed and fumigated. Most often, though, death comes slower. Vomiting from seasickness leads to dehydration. People pass out from exhaustion. In May 2011, Mr. Mndolwa and Mr. Kobelo got their chance at a new life. They overheard a deckhand in port mention that the red-bottomed ship waiting dockside with no night watchman was leaving soon for England. Carrying their passports, a loaf of bread and a plastic bag filled with orange juice, the men shimmied across the ship’s mooring rope that night, crept down to the engine room, and stayed there, whisperingly still, for the next five days. But their hiding spot soon proved unbearable. The turbines left their ears ringing. The fumes made them lightheaded. The heat “stole our breath,” Mr. Mndolwa recounted. Within two days their food ran out. Creeping through the mazelike lower levels of the ship up to the deck, they found crackers and bottled water in an enclosed lifeboat. They were discovered there four days later. Locked in a room below deck, they waited while the captain and crew determined their fate. Though small, Greece is a superpower in the maritime world, with many shipping lines and a disproportionate number of the wealthiest shipowners. Nearly half of the best known shipping families hail from Chios, a tiny Greek island five miles off the coast of Turkey that was long prized by successive empires and nations. Proud of its nautical pedigree, Chios claims as native sons (not without dispute) two great men of the sea — Homer and Christopher Columbus. It is also home to George Kallimasias, whose family has been in shipping for three generations. By most accounts, he runs Commercial S.A., which operated the Dona Liberta and a fleet of about two dozen similar ships. Even in a struggling economy, Greece’s shipping magnates benefit from favorable government treatment, including an exemption for shipping firms from certain taxes. Shipowners control most of the country’s major oil companies, soccer teams and television stations, and played a major role in bailing out its banks in recent years. The nation’s major shipping families also have a reputation for noblesse oblige — many of the island’s soccer fields, schools and hospitals bear plaques with their names. Mr. Kallimasias, though, is decidedly invisible. “He is nothing like the others,” said a dockworker at the Chios marina. He pointed to Mr. Kallimasias’s 107-foot yacht, Something Wild, which the worker said is always guarded and rarely used. Mr. Kallimasias’s seaside house in Chios sits behind a 15-foot wall. When he drives around, he is typically accompanied by bodyguards, according to a former employee and associates in Athens. “The guy is smoke,” said Lefteris Kormalos, a ship engine parts dealer. Last year, Mr. Kormalos won a court decision for $30,000 in unpaid debts from Mr. Kallimasias, who is named in at least 15 similar lawsuits in Greek or American courts. Legal documents variously describe him as owner, consultant or managing director of Commercial S.A., another business called Fairport Shipping and the Dona Liberta. Built in Japan in 1991, the Dona Liberta was operated or owned by several British and Japanese companies before Commercial S.A. acquired it in 2004. It had variously been named the Emerald Reefer, the Sanwa Hope and the Sun An. Over the years it has flown the flags of Panama, the Bahamas and Kiribati, a tiny island nation in the Central Pacific. Known more commonly as “reefers,” this type of refrigeration ship is a dying breed that has been squeezed out of the business of transporting fruits and vegetables by container ships that are more than three times their size and have superior temperature-control technology. To survive, many reefers have shifted in recent years to moving fish, much of it illegal, and other contraband like counterfeit cigarettes and drugs, according to maritime insurance officials. Mr. Kallimasias did not respond to interview requests. A clerk at the office of Commercial S.A. and Fairport Shipping in Athens shouted at a reporter through a front-gate intercom that it was inappropriate to have visited there, a point reiterated later in an email from Fairport’s lawyer, Alexandros Papalamprou. In the 1980s, when one of Mr. Kallimasias’s companies failed to repay a loan of more than $11 million to the National Bank of Greece, members of the Greek Parliament investigated. They found one ship of his worth seizing, but it caught fire at sea and sank, in what was believed to be a deliberate act to collect insurance on it, according to legal documents provided to The Times by a Parliament member. Dinos Anargyrou, a former Kallimasias supplier and litigant, recounted how the courts were unable to seize Mr. Kallimasias’ assets in 2013 for another unpaid debt. At the last minute, his company moved its corporate address from a two-story luxury building in an upscale section of Athens to a 100-square-foot vacant apartment in an aging downtown high-rise. In whispered phone calls or surreptitious notes, crew members from the Dona Liberta regularly contacted the international seafarers’ union, pleading for help. They described safety violations, harsh conditions, wage theft and abandonment, union records show. “Lack of winter jackets, hard hats and safety shoes,” one union inspector wrote, describing crew members working outside in Norway in November. In Spain and South Africa, the crew complained that the captain routinely doctored the log books to show wages that were never paid and ship repairs that never occurred. “When your contract is over, they send you home, saying they’ve transferred the money,” Yuriy Cheng, a Ukrainian, wrote in an undated post in Russian on a mariners’ online forum about the Dona Liberta’s owner. Mr. Cheng described a standoff on his ship between management and the mostly Filipino crew members, who stopped work after a year of not being paid despite threats that they would be jailed if they failed to deliver the cargo. In June 2011, George Cristof, a veteran sailor, knew something was wrong from the moment he stepped on board the Dona Liberta in the Port of Truro, England. Hired by a maritime employment agency in Galati, Romania, he had been instructed in a brief call with Mr. Kallimasias’s shipping company to fly immediately to England because a full crew was waiting, ready to launch. But when he arrived, Mr. Cristof found the situation far different, he recalled in an interview. The provisions were gone, the cargo hold empty, the crew departed. The Dona Liberta had barely enough fuel to power the wheel room’s overhead lamp, much less run the ship’s 5,600-horsepower engine. Mr. Cristof was soon joined by another Romanian, Florin Raducan, and for the next several months the two men survived by fishing over the side and begging for canned goods and bottled water from passing ships. Some days they did not eat. They lacked the money and documents needed to disembark and return home. Their phone cards were drained, their cigarettes were all but gone. The men had no heat, running water, functioning toilets or electricity. They collected rainwater to clean themselves. “It wasn’t enough,” Mr. Cristof recounted. He soon developed a severe fungal infection on his chest, his medical records show. Each day the men waited for orders that never came. “Jail with a salary,” Mr. Cristof said, reciting a common expression about work at sea. More than 2,300 seafarers have been similarly stranded by their employers over the last decade, United Nations data shows. A ship’s cargo is often better protected than its crew. The industry only recently imposed rules, taking effect in 2017, mandating that shipowners carry insurance or show other proof that they can cover the costs of sailors marooned in port, as well as seafarers’ death and long-term disability entitlements. In England, an aid organization came to the rescue of the two Romanians. “They did not want to stay but they refused to leave,” Ben Bailey, project manager of the group, Mission to Seafarers, said of the men’s predicament. Each sailor had paid more than $1,000 to the employment agency to get the job on the Dona Liberta, he said. Abandoning the ship forfeited any chance of recouping that money or collecting the wages promised to them. After five months, though, Mr. Cristof and Mr. Raducan gave up. They flew back to Romania. For Mr. Cristof, the breaking point had come when he learned his children could no longer afford school. For Mr. Raducan: finding out that his wife had resorted to begging in public. Few crimes are tougher to investigate than those that occur at sea. There are no cameras on the corner, no phones to tap, usually no weapons to retrieve. Crew members are often changed mid-voyage, so witnesses are scarce. “The crime scene is moving,” explained Mr. Young, the former Coast Guard official who is now senior officer of conservation enforcement at the Pew Charitable Trusts. Asked about investigating the Dona Liberta’s possible crimes on the high seas, a United States Coast Guard official said it was not its jurisdiction. The authorities there said that its role was mostly to pass information between countries. Officials at the International Maritime Organization, a United Nations agency, said that the country whose flag the vessel flies is supposed to investigate any allegations. An official at the Bahamas flag registry program said that any inquiry by his office would be referred to the I.M.O. Early one morning in April 2012, the three-person staff at SkyTruth, an environmental watchdog group based in West Virginia, huddled over satellite footage sent from the European Space Agency. Their attention was quickly drawn to a half-dozen black slashes — what looked to them like intentional dumping from ships — in waters off the coast of Africa. On the leading edge of the slick, the Dona Liberta was headed northwest. Ships have several options for handling the large amount of oily wastewater and fuel sludge that their engines produce during voyages. They can incinerate it on board, pay to unload it at a waste depot or — cheapest of all — use a “magic pipe,” a jury-rigged hose that illegally pumps the waste directly overboard or underwater. That episode of dumping was not an isolated event. In February 2012, British environmental authorities had to clean up a slick caused by the Dona Liberta in the River Fal. Eight months before that, the ship was cited by Russian inspectors for having doctored its oil logbooks, a telltale sign of illegal dumping at sea. The Dona Liberta was cited for the same offense by Spanish inspectors in July 2009, Dutch inspectors in 2005, and British inspectors in 2004. This time, no investigation was even opened. When other environmental groups alerted United Nations maritime officials, Interpol and the United States Coast Guard about the oil slick, officials said they had no jurisdiction. “Of the few people watching, even fewer do anything to stop it,” said John Hocevar, the oceans director at Greenpeace. Stowaways have long been forced to walk the plank, subjected to the rough justice of the oceans. Though often victimized, they are also trespassers, usually desperate, occasionally dangerous, but by no means a new problem in the maritime world. More humane captains put stowaways to work before dropping them off at the next port. But in recent years, European immigration laws have tightened, terrorism fears have grown and port authorities around the world have responded by raising the penalties for ships arriving with people not listed on the manifest. The rules on land, though, often conflict with the realities at sea. Captains are prohibited from jettisoning stowaways, but they are blocked or fined if they bring them to shore. Nations have generally shifted the responsibility of handling stowaways onto the shipping industry, putting pressure on shipowners, captains and crew, said Paloma Maquet, an expert on stowaways based at Université de Poitiers in France. 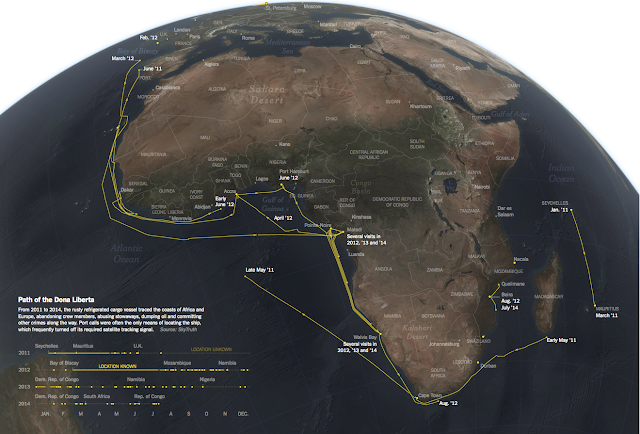 In 2014, two Guinean stowaways, one of whom soon drowned, were pushed or leapt overboard off the French coast after several African countries would not let them disembark, according to media accounts and human rights advocates. Police investigators said the fees were a factor in the episode. Two years earlier, a crew threw four African stowaways into the Mediterranean (all survived) after the captain was told the costs of repatriation. These expenses can run to $50,000 per stowaway, or double that if cargo delays are involved. On their raft in the Atlantic Ocean, Mr. Mndolwa and Mr. Kobelo woke up the morning after the storm to an azure sky. They sat up, untied themselves, and began passing the time talking about soccer and their families. Malnourishment, dehydration and the frigid ocean spray had sapped them. By sunset, panic set in as the temperature began falling. “Words dried up,” Mr. Mndolwa explained. He began saying the Lord’s Prayer, first in his head, then aloud. Mr. Kobelo joined in until he began coughing, and vomiting blood. Hope soon appeared as a speck on the horizon. A 10-foot wooden boat with a loud outboard motor was approaching. “Why are you there?” a fisherman yelled in broken English as he tossed a rope to the raft. “I don’t know,” Mr. Mndolwa replied. A half-day later, the stowaways arrived at a fishing pier several miles outside the port city of Buchanan, Liberia, where they were soon detained for being undocumented. “Why do you put us in jail and let the crew go?” Mr. Mndolwa recalled asking a Liberian immigration official. “The authorities deal with crimes on land, not on the water,” he said the official responded. Six days after reaching land, Mr. Kobelo, whose coughing had grown worse, died. Sitting in a one-room house in Dar es Salaam, Tanzania, his brother, Michael, 37, said he blamed the Dona Liberta for the death. His brother broke the law by stowing away, he conceded. 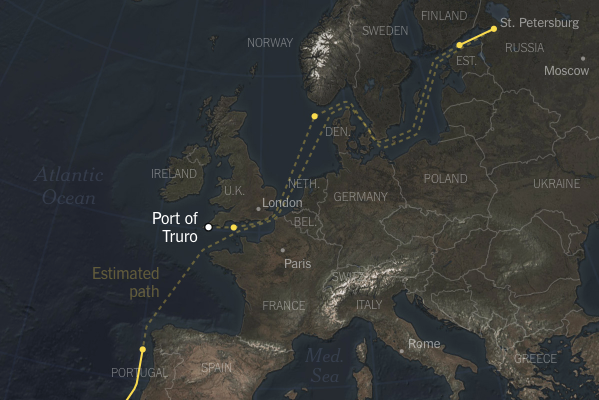 The Dona Liberta arrived in the Port of Truro, near the southwestern tip of England, in June 2011, about a month after the stowaways were set adrift. The British police, apparently alerted by Liberian officials, boarded the ship and interviewed the captain. They later closed the investigation for lack of evidence, according to port officials. Capt. Mark Killingback, the harbor master for the Port of Truro, said that it was clear from its weatherworn appearance that the Dona Liberta had fallen on hard times. He added that his office had received several requests from foreign creditors to detain the ship. After his arrest, Mr. Mndolwa remained in his cell for five months before being flown to Tanzania, and eventually returned to Cape Town. Now 27, he lives near the same bridge as he did before boarding the Dona Liberta. The encampment, which includes other stowaways, is a dangerous spot. On a portside slope strewn with trash and excrement, Mr. Mndolwa’s thatch and stick lean-to contains a soiled blanket and dozens of losing lottery tickets, dangling like a mobile. One recent day he tried to sell a couple packs of gum and some hair braids to drivers waiting at a nearby stoplight, later bartering his faux-leather belt for shoelaces from another homeless man. He will try to stow away again, he said. For much of last year, the Dona Liberta disappeared after turning off its location transponder. Though illegal under most conditions for large ships, disconnecting the device is easy and especially common on vessels carrying contraband. Then in November, the rusty reefer reappeared in the Gulf of Thailand. 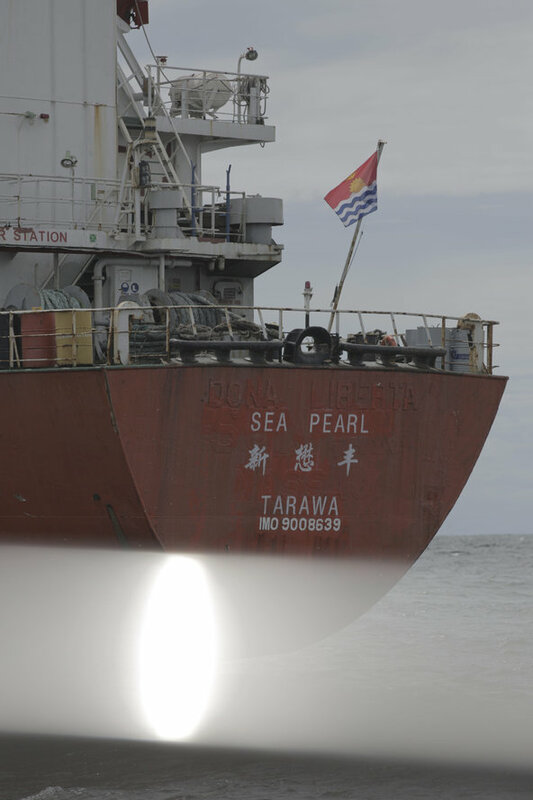 When approached by a reporter eight miles off the coast, the Chinese captain explained that his ship had a new owner — a Chinese company — and a new flag — Kiribati. Asked about the ship’s past misdeeds, the captain demurred. “Different company, different company,” he said.